I don’t remember much about Tetris Attack. I know that it wasn’t actually a Tetris game and that Yoshi was involved somehow, but that’s about it. I played an awful lot of puzzle games in the 90s, and this isn’t one that stuck with me. But I’ll never forget its unrelentingly happy soundtrack. Playing a puzzle game can be a pretty stressful experience. Most titles start out slow and simple, but rapidly ramp up the difficulty. Things get more and more challenging until you’re completely overwhelmed, and wind up buried in a pile of incorrectly-colored capsules or S-shaped blocks. The music often goes out of its way to add to the tension. 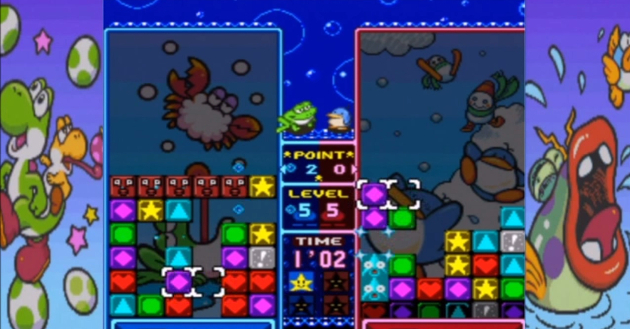 The original Tetris theme is panic-inducing, and many other puzzle titles feature similarly intense tunes. But the Tetris Attack soundtrack is designed to counteract these feelings of anxiety. The music is both relaxing and charming, and will leave a smile on anyone’s face. It’s incredibly sweet, but never saccharine, and it’s everything a puzzle game soundtrack should be. Puzzle games are nerve-racking enough on their own; the soundtrack shouldn’t add to your frustration. They need music that can calm frazzled nerves, allowing players to keep their cool when things get tough. I’m not sure if Tetris Attack was a challenging game. I can’t remember if I played it by myself or against others, and I don’t know whether or not its gameplay put me on edge. But I’m certain I couldn’t have felt anything but joy when listening to its delightful soundtrack.